Baker, Neal and I at the finish when the sun came out! 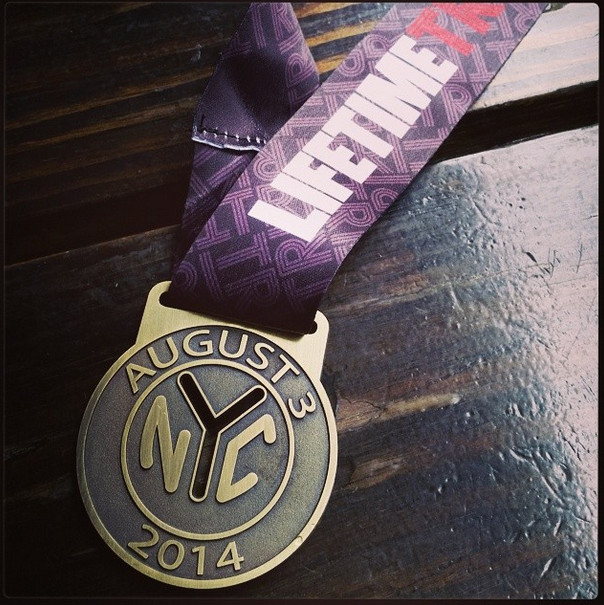 My triumphant return to the NYC triathlon deserves a blog post. 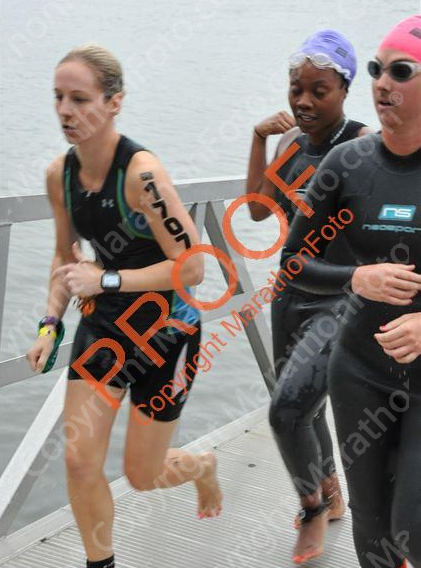 I haven't participated in the race since 2010, though I attempted in 2011 but was denied by my orthopedist two days before (badly sprained ankle) AND my oral surgeon (dry socket= open mouth wound=no Hudson River swimming). 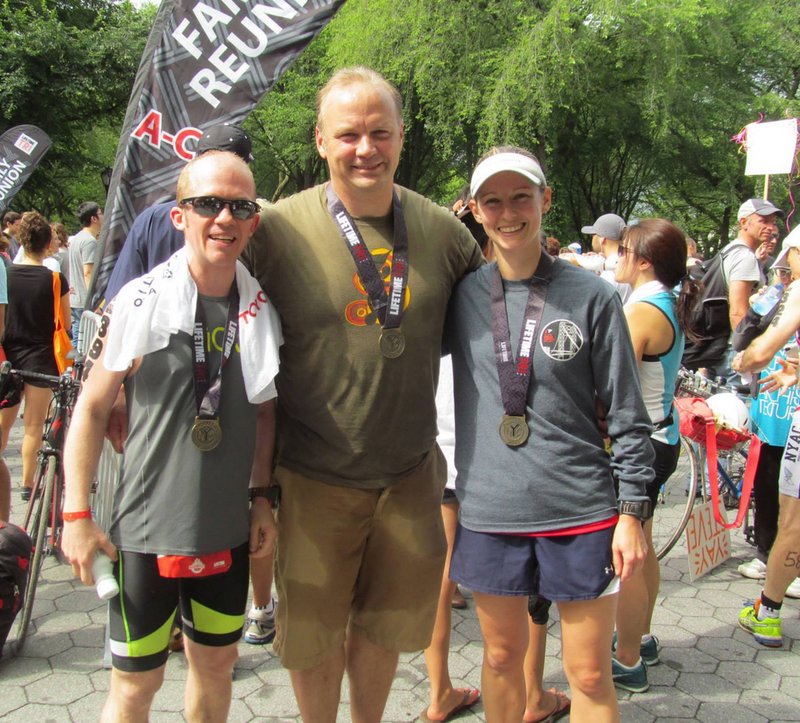 So when I plunged into the Hudson on Sunday morning, it was exciting to be back. Yes, for those of you new to this blog, I swam in the Hudson River next to Manhattan. And not for the first time. I think it was the 5th time, though this time might have been the murkiest. I've been training steadily for this race for a few months under the tutelage of the talented Chris Baker (http://beyonddefeat.com) I went into it feeling really confident in my fitness and readiness. Perhaps too confident because I was eyeing a 2:30 goal, which I realize now was silly. Anyway, despite my confidence in my ability to race I felt nervous on the morning of. I was comforted when I bumped into several friends and 2 co-workers/friends before the start. I actually started the race side by side with a new friend from work, which was great. We hopped into the dark, murky Hudson together with a splash after waiting for our wave in the increasing rain. Oh joy, rain. The swim flew by, I mean FLEW. To give you perspective, if I could swim that fast (1500m in 14mins 55 seconds) in a pool, I'd be a world record holder. So no, the tide was not "slack" as was mentioned at the briefing on Fri. I checked the tide charts on Saturday and knew that was wrong anyway, but I still couldn't believe how strong it was. Weeeeeeee! I cruised down the river, no problemo. I even slowed down to pee. It got very crowded near the finish with people stopping and dorking around, but I just went right through and got out. What were those people doing? Get out! T1 is rough at NYC if you're in yellow transition, the half mile barefoot run on the concrete is trying on a good day, but I have a painful neuroma in my foot that mostly hurts when.... You guessed it, when I am barefoot. I can't even walk on the hardwood floor barefoot at home, so running on pavement was more than a little annoying. I ran quickly just to get it over with asap. It was still raining at this point, but I decided to put on my socks... A move I'd regret later. The bike was wet and a bit crowded, but I kind of enjoyed it. I felt pretty confident out there, despite the wet conditions. For once, I was the person passing with a quick "on your left" to alert someone if my presence on their left side. There were a couple of women who kept getting in the left lane and hanging out there, like bad New Jersey drivers. You can be disqualified for riding on the left instead of passing and moving back over, similar to driving. It was a bit crowded, but these few women were driving me nuts. I tried to get aways from them, but since I was trying to crush the downhills and stay steady on the uphills, we kept playing leapfrog. Part of me really hopes they got time penalties for being so clueless and annoying while the other part of me doesn't care *that* much. 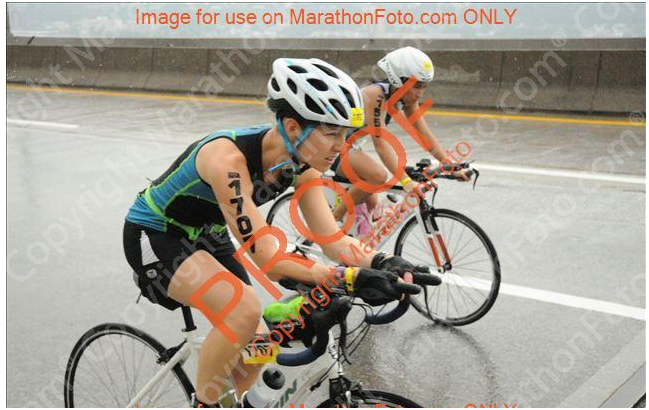 In the end didn't exactly "kill it" on the bike, but I was happy knowing that I handled the wet conditions safely. 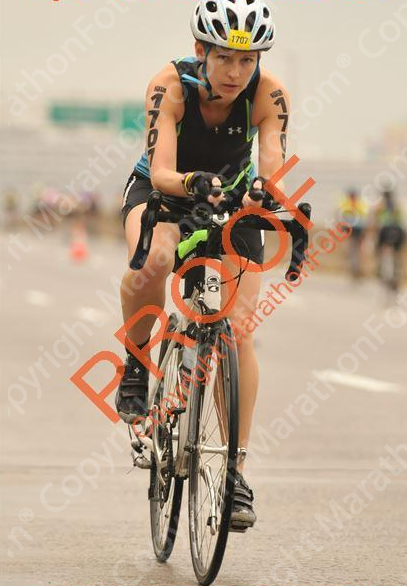 The spray from the bikes in front of me throughout the race may haunt my dreams for a while. Each time I caught someone or was passed I thought "oh, it's raining harder..." before I realized it was just the rooster tail of road grime and rainwater they're were spraying in my face. Yuck. T2 was pretty quick and it seemed easy enough, but I made a terrible rookie move. When removing my bike shoes I knew my socks were drenched and I didn't have another pair in transition, so I made the numbskull move of taking them off completely and running in my new-ish shoes. I've worn them a few times, but never sockless. Oops. 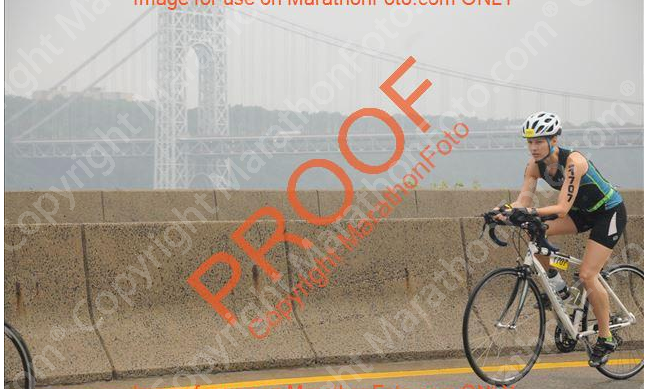 I trotted out of T2 feeling good and already passing folks on the way up the hill out of Riverside Park. The run... I've already alluded to what happened to my poor feet, but it didn't really sink in until about mile 2. At that point of already seen a couple of friends, Abbe, Claire and Matt and I was really moving along. I was having a great run with the exception of this scraping feeling on my right heel. Even my neuroma was behaving for the most part. 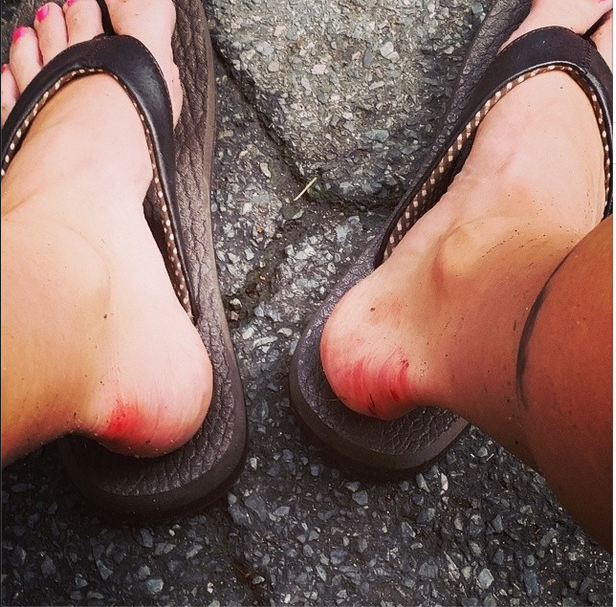 I reached down at mile 2 to see if there was a rock or dirt causing the pain and I noticed my heels was already bleeding. The damage was done. Damn. I tightened my shoe with the hope that it would reduce the friction, but... it didn't exactly work out. I tried to put it out of my mind and just kept passing the throngs of people out there. I should have kept count... It was probably a couple hundred. I felt fantastic - the entire run. I couldn't believe how quickly the miles were ticking off and started to pick up the pace as I went along. My final mile was at a 7:18 pace or something like that. That's my 10K pace when I haven't swum and ridden beforehand! I ran into Neal as I turned onto the last 0.25 mi loop around Cherry Hill in Central Park and we exchanged a quick hello and I kept going ahead. 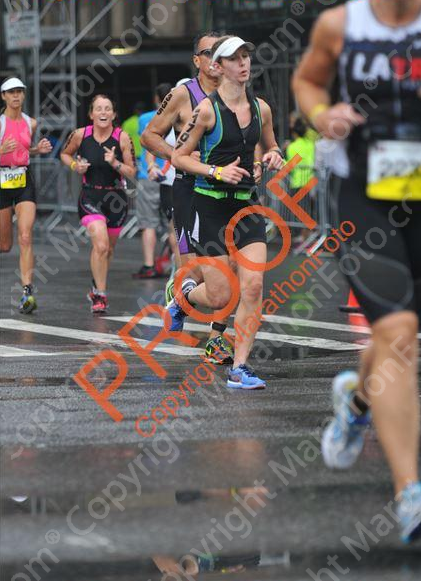 I was having so much fun with the crowds all around that I stomped in a giant puddle on one of the final turns, causing a giant cheer from the crowd. It was fun. By the time I crossed the line my feet were both on fire and I couldn't think of anything else but getting my shoes off. I limped to baggage and quickly slipped into my flip flops. Someone behind me pointed out my bloody heels as if I wasn't fully aware of them. Thanks, neighbor! Ouch. I still can't wear shoes with backs yet. Rookie. Otherwise my recovery was quick and easy, as tris tend to be. I'm ready to rock and with a new bike waiting for me at a local shop and vacation (aka time for training) looming- life is good!